Everyone knows that your body uses food as fuel, but it’s a pretty complex equation. In order to metabolize that food and turn it into a form of energy your body can actually use, it needs certain vitamins, namely the B vitamins. These multi-purpose, hard-working vitamins support the energy metabolism process and help your body create energy from the sandwich and salad you had for lunch! So it makes sense that the most common symptoms of a B vitamin deficiency are fatigue, weakness and digestive issues. Iron is also linked with energy support because it is a vital mineral in your bloodstream, working all throughout your body to transport oxygen through the tissues. An iron deficiency includes symptoms of tiredness, irritability and decreased performance at work or home. If you feel like your energy is lagging more than usual or that you don’t have the zip that you used to, don’t turn to a quick-fix energy drink. 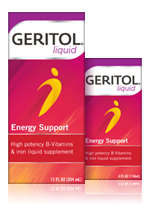 Talk to your doctor about a supplement like Geritol liquid. It may be exactly the energy support you’ve been looking for.